This photo is so gorgeous that I decided to add it to my Zazzle shop! 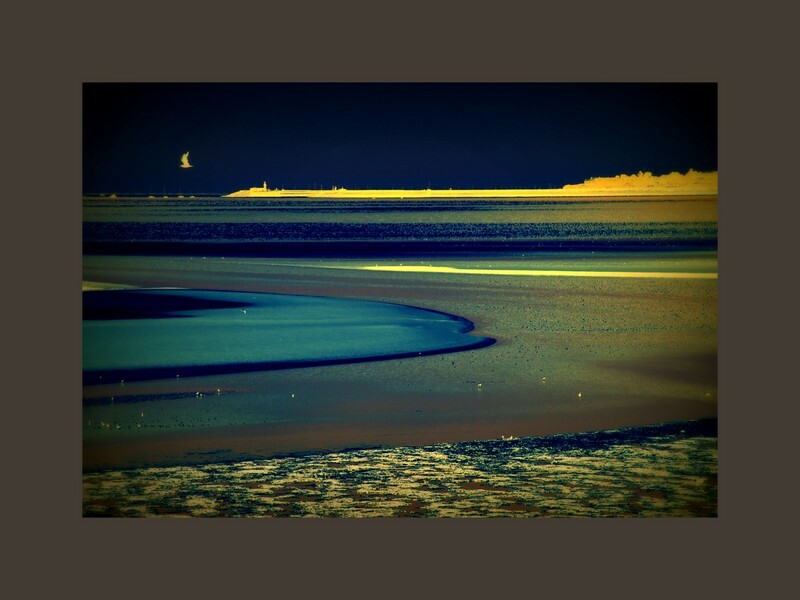 View from the walk from Sandymount to the South Wall. I took this photo last Sunday morning, as we were walking towards the South Wall to see the Tall Ships leaving Dublin. A few special effects in Picasa, ... and voilà! 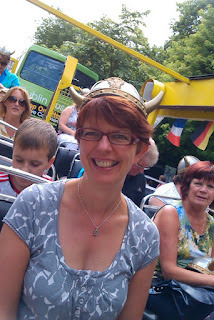 Thoroughly enjoyed Viking Splash last weekend with my brother and nephew. Great overview of the main tourist spots around the city centre, lots of interesting historical facts (which I've all forgotten already), plenty of roaring at innocent pedestrians, and a quick splash in the Grand Canal basin. It was good fun - and did you know that when you put on your life jacket, you should make sure to unbuckle your seat belt, because there is no point in wearing a flotation aid if you're attached to a 2-ton vehicle! My nephew is six and doesn't speak English, so I think he was a bit young for it - he enjoyed the roaring and the bit in the water, but I'm not sure he'll remember much of the bits I translated for him (Qu'est-ce qu'il dit, le monsieur?). He'll probably enjoy it more when he is ten. I wasn't in the mood for a big painting this weekend, so I decided to do colour swatches from the book "Blue and Yellow don't make Green", by Michael Wilcox. I was reminded of it by a comment from Ruth McCabe on Facebook recently. I've had that book a few years now, and every so often, I go back to it. Each time I do, I'm really glad. 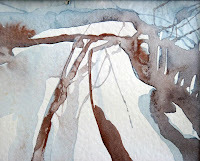 I was finding that the last few watercolours I did were not great in terms of hues - I was using nice colours: Indigo, Prussian blue, Madder red, but the overall effect lacked oomph. When that happens, it's time to get back to basics and good colour mixing! The colours I was playing with this weekend were cadmium red (PR108), violet red (PV19), cerulean blue (PB35) and vanadium yellow (PY184). I can get really engrossed in my little colour squares, and I spent hours mixing and admiring them. I found that some of the mixes were really vibrant. So, when I was finished with my last set (with PV19) and I still had paint left in my palette, I couldn't resist. I decided to try out a quick painting. Sometimes, that's a recipe for disaster. But I think this one turned out lovely. OK, maybe not the perfect composition, and the leaves are a bit stiff, but the colours sing to me like nothing I've painted this summer! You can't get posher than Dublin 4, really. But somehow, I thought that Ballsbridge was considered a better address than Donnybrook. And I always wondered why. Now I think I know. I came across the word "donnybrook" in an article in Newsweek recently, and found out from BB that the word meant a brawl, a fight. And the reason for this meaning is that there used to be a fair held in Donnybrook, where fights used to erupt quite regularly, and the word found its way into everyday language. If you don't believe me, check it out in dictionary.com! I wonder if the owners of Donnybrook Fair realise that the name they chose for their grocery store was not always synonymous with the refined and exclusive shopping experience that it now brings to mind? I discovered Ruth McCabe by accident, via Facebook, and I love her watercolour work. I have to admit some of my paintings in the last few months have been inspired by her style, but nothing I produce comes close.Beautiful colours and great freedom. If you like these paintings, go and check out her other works on this online photobook! Productive weekend - as my rainy sky over the North Sea watercolours were not going well, I cheered myself up by drawing and painting the flowers I was given last week. The red roses are still going strong, and also the lilies. I quickly decided that painting the roses was going to be too hard and I focused on a beautiful pale pink lily instead. Apart from one muddy area in the bottom petal, I was happy with the result. - If a painting is not going well, move on to something completely different. - And also, go back to basics: mask detail areas, paint wet into wet for a soft look, pick up wet paint with absorbent paper to create highlights. - And most of all, don't ever paint over an area that's covered in speckled paint, unless you want muddy colours. 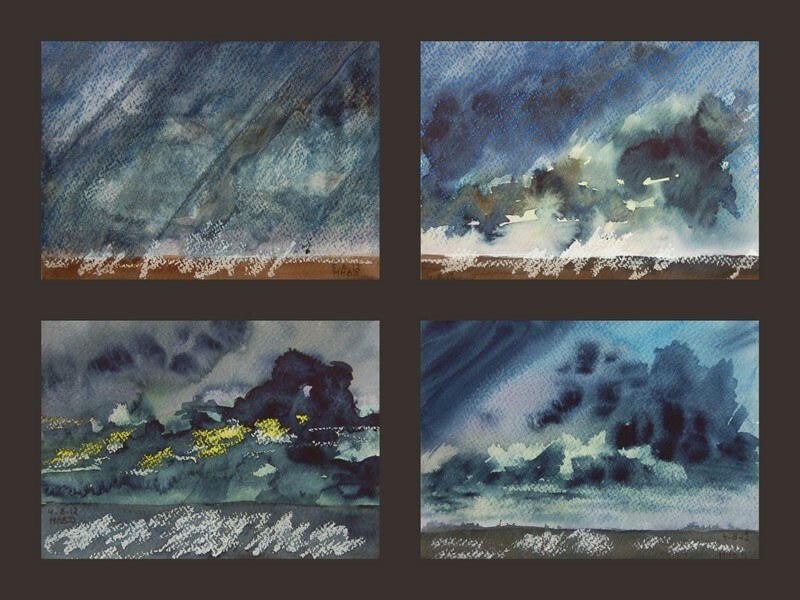 Since the watercolour versions were not working too well, I picked up my pastels yesterday and approached my North Sea painting from a different perspective. Much happier with the result! I've got one cloud too many in the centre, but apart from that, I think my sky is pretty convincing. And in case you're wondering, the crazy white lines in the bottom are waves - in my head if nowhere else! Detail, detail! I don't know how to describe The 19th Wife. 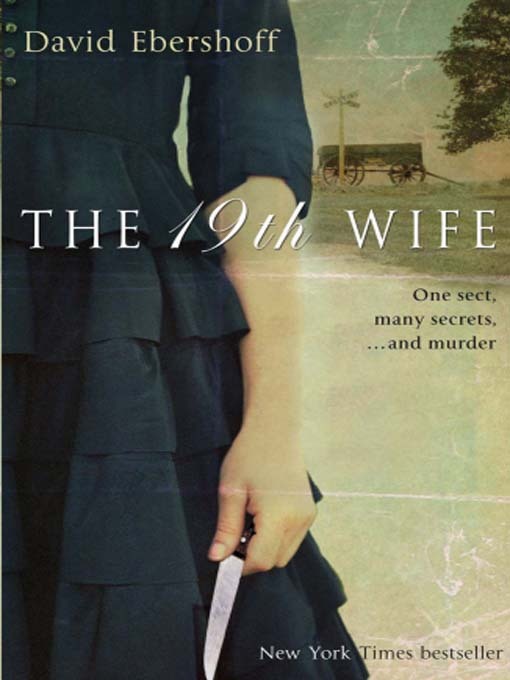 It's about polygamy in the early days of the Mormon religion, and also about a crime committed in a remote polygamist breakaway community. And because of that, I can't say if I liked it or not. I thoroughly enjoyed the modern-day story. It was well-paced and the characters were likeable. But I found the early-Mormon story too long-winded. And yet, I know that it was essential in my understanding of the background to the contemporary plot. I just wished the balance of the book had been more even. Maybe I should have skipped the bits I didn't like? Inspired by a photograph of heavy skies over the North Sea taken by a friend of mine, I painted 4 little watercolours of rain clouds this weekend. Not entirely successful, but they don't look so bad in a Picasa collage. Sing you home is about Zoe - she's married to Max and they've been trying for a baby for nine years, and after multiple rounds of IVF, she is 28-week pregnant. She loses the baby, and Max leaves her. Max starts drinking again, then he finds Jesus. Zoe, a music therapist, starts to build up her life again, then she has cancer and when she meets Vanessa, they fall in love. And that's not even half way through! Normally, Jodi Picoult's books deal with big topics, Asperger's, brittle bone, being Amish, being born to provide a bone marrow transplant for your leukemia-suffering sister, but generally one at a time. She must have been supercharged when she started writing Sing You Home! And then of course, the real big topic is about who has the right to those frozen embryos. And then there is a court case, of course, with a really nice lawyer and a really nasty one! That's quite a handful! 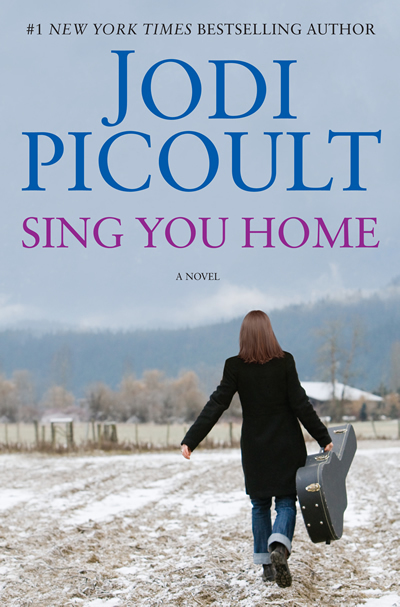 And yet, like most of Jodi Picoult's books, it's such a cracker of a story that you can't put it down. I didn't cry, though! Maybe I am becoming immune to Picoult's heart-wrenching stories? They're a very efficient bunch. BUT - customers have to enter a 17-digit reference number, and then a pin number on the website to renew. Seventeen digits! SEVENTEEN! There are less than than 4 million people living in the Republic of Ireland - so a 7-digit number would be enough to cover every soul in this country. I'll probably enter it wrong 3 times before I can get it right! And I'm reasonably good with numbers.